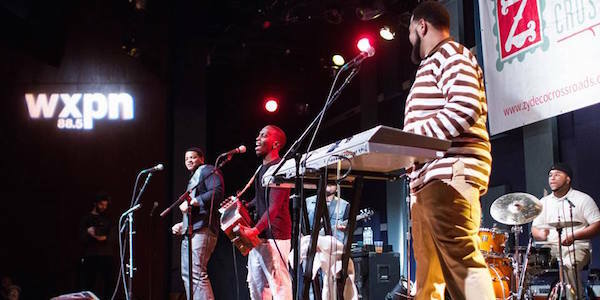 Koray Broussard brought the Zydeco Unit up to World Cafe Live in Philadelphia for a sold-out dance party last month. You can listen back to the audio of that performance below. Broussard and his band (Broderick Freeman on keyboard, Darryl Dardin on drums, Shone Richard on rubboard, Lance Ellis on bass and Broussard on accordion) played an hour-long set of zydeco tunes, including his hit “Pretty Girl Rock” and a cover of Cupid’s line-dance “Cupid Shuffle.” Listen below and revisit Leon Chavis’s set from that same night here. Sign-up for next month’s free Zydeco Crossroads event here, featuring sets by Marcus Ardoin and da Zydeco Legendz and Rockin’ Dopsie Jr. and the Zydeco Twisters.